Unofficial Pirates - How I became a Naughty Boy! How I became a Naughty Boy! To me, the naughty boys never really existed until the Pirates moved from their temporary home at Kenwyn, in Truro, to play at Camborne Rec and, even so, the then to be inaugural members didn’t actually know each other until forthcoming events threw us together. Initially, at Camborne, I didn’t know where the best vantage point was so a fellow naughty boy, Sammy Mundy, and I stood on the opposite side from the main stand where, to be honest, the view of the whole pitch was fairly good but had a poor atmosphere so we also tried watching from the right hand side of the stand then, finally, from the left hand side of the stand. It was here that there seemed to be several individuals with, how shall we say to be polite, the ability to project their voices (ok, they were loud mouthed gobby so and so’s, but also inoffensively funny!) to inform ‘Sir’ of the rules or of what his myopia had missed and, also, to bait away players with a bit of fun-filled banter. This area seemed the best place to stand as there were more people standing here which, along with the aforementioned banter, gave a good atmosphere so this is where Sam and I adopted as our now regular viewing vantage point. Anyway, having never been to a Pirates away game I suppose the one I chose to break my duck couldn’t have been better – the EDF cup final against Exeter (whatever happened to them since then, I wonder, lol) at Twickenham! Having beaten Plymouth in the semi-final, coaches were arranged at the Admiral Benbow by the infamous Marshy (I’ve not seen him lately at any matches, hope he’s ok) for the trip to Richmond and off we went for what is now remembered as a fantastic day out. From this I discovered that there was a rebirth of an away supporters club, the Pressgang, so I went with them to the last away game of the 2006/07 season in Coventry. This coach was sponsored by Skinners to the tune of two barrels of beer so when we arrived at Butts Road we were in a fine mood with voices suitably lubricated by free beer and debussed to partake of (a liquid) lunch in the now closed Butts Retreat pub prior to the match across the road (closed because we don’t go there anymore?). It was in this pub I first met one of the soon to be naughty boys with the nickname of Fergus who endeared himself to me by implying I should be watching the round ball up the road, all because I ordered a cola drink – typical of his sense of humour! So, a few ciders later (yes I changed my order and didn’t have cola as I prefer rugby to footie) we all went to watch the game and this is where I met even more future naughty boys, including Martin ‘Woll’ Woollatt resplendent in a blonde wig (lovechild of Betty Stoggs? ), where we amassed on the temporary seating that was available opposite the main stand there. Someone had bought a battery powered speaker that blared out ‘Sandstorm’ as the Pirates took to the pitch and there was a carnival atmosphere throughout the game (except when Mat Evans broke his ankle – ouch, that was a bad moment! 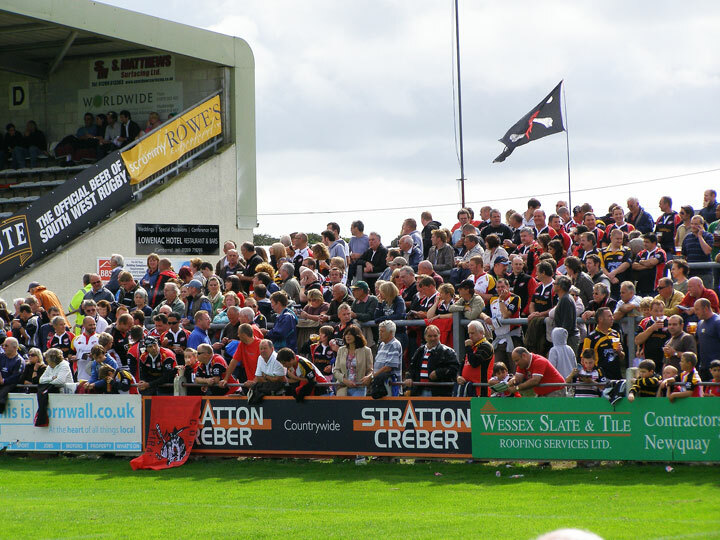 Anyway, the next season (07/08), back at Camborne, a few of us recognised each other and we began to interact and chat to each other and a small army of about twenty of us soon became regulars in the same area. There were the likes of Janner (plus Tina, his extremely tolerant wife) and Karl (aka the Ginger Ninja) both of whom were, and still are, the ringleaders where banter is involved – the best of which was to get a Bedford player to give us the bird (middle finger) in response to the merciless ribbing he was getting from us. He was smiling, as he did so, and we took it in the fun spirit it was meant (unlike the roundball fans whose delicate constitution would have been mortified by this gross act of bringing their game into disrepute)! Others who stood with us were Fergus (whenever he could get down from Worcester), Wally and wife Maggie, Luxlad and wife, Cockney Dave, Pirate Bert, Leicester Pirate (occasionally), the Mullion ladies, the Zelah girls, Jane, Yog, Woll (now wigless) and Sue plus others whose names I can’t recall (apologies, but I’m sure those with better memories will post names below) and sometimes Blazey would come down from the stands to lead us in his ‘Give us a P’ chant. There was one other who had the tendency to overdo the banter and use a bit of offensive language and he is, to date, the only naughty boy to be drummed out of the group (I won’t mention his name but if he was royalty he’d be the Duke of York) plus I lent him a sum of money when he was down on his luck to which he hasn’t repaid me a penny so the least said about him the better – anyway, he only comes to games when the Sky TV cameras are showing Pirates games so he’s only interested in himself and not a true supporter imho! Moving on then, so far we were just a group of like minded fun loving rugby enthusiasts who gathered together at home games to have a jolly time but weren’t known as the naughty boys until so named, I believe, by non-other than our very own Dickie Straughan in one of his very well worded match reports. And so the tradition began which continues to this day, we even have our own named area at the Mennaye now, and despite our numbers dwindling at current home games I’m quite proud to be one of the existing original members! Re: How I became a Naughty Boy! Naughty Boy's Corner has always been my area of choice whenever I can make it down for home games, both at Camborne and the Mennaye. Long may it continue!